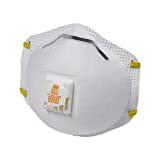 This lightweight half face respirator provides protection against particulates. The mask's NIOSH rating indicates that the filters provide a minimum of 99.97% filter efficiency for airborne particles. Medical professionals use N95 masks when they expect to come in contact with SARS and other contagious diseases. These filters, P100, are more secure than even the N95 filters. Amazon's current #1 best seller, this respirator is made by 3M. The valve resists both heat and moisture and is is approved by the federal government (NIOSH), having passed their strict performance standards and have been certified. That certification means that the respirator has passed stringent government performance standards including filtration efficiency testing and provides at least 95% filtration efficiency solid and liquid particles that do not contain oil. A radical Islamic organization which operates primarily in the West Bank and Gaza Strip whose goal is to establish an Islamic Palestinian state in place of Israel. On the one hand, Hamas operates overtly in their capacity as social services deliverers, but its activists have also conducted many attacks, including suicide bombings, against Israeli civilians and military targets. In general, the term viral hemorrhagic fever is used to describe a severe multisystem syndrome wherein the overall vascular system is damaged, and the body becomes unable to regulate itself. These symptoms are often accompanied by hemorrhage; however, the bleeding itself is not usually life-threatening. While some types of hemorrhagic fever viruses can cause relatively mild illnesses. "The Party of God". One of many terrorist organizations which seek the destruction of Israel and of the United States. They have taken credit for numerous bombings against civilians, and have declared that civilian targets are warranted. Hezbollah claims it sees no legitimacy for the existence of Israel, and that their conflict becomes one of legitimacy that is based on religious ideals. Another of its ideals is the establishment of the an Islamic Government. Germany and Britain have both attempted to have Hizbollah added to the European Union's terror list, but with support of the French government, they remain off the official list. Agency organized after September 11, 2001, with former Pennsylvania Governor Tom Ridge heading it up. The Office of Homeland Security is at the top of approximately 40 federal agencies charged with protecting the U.S. against terrorism. The White House coined the term to replace the old "suicide bombings." Volunteers from around the world -- notably the US and Canada -- who went to Iraq in order to stand at strategic sites in order to try to deter allied bombing. Most of them came home around the time of the first bombings, one claiming that he didn't know it was such a dangerous duty.